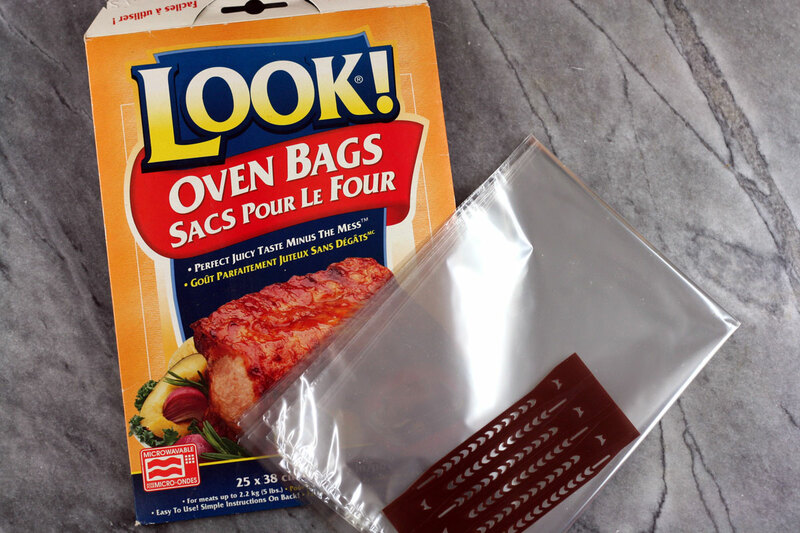 Oven Bags are bags designed for foods to be put in then cooked in the oven. They are made of nylon or polyester that is heat-resistant, generally up to 400 to 450 F (200 to 230 C.) Read the directions on the box of the brand you have purchased to see what heat it can stand. Oven Bags come in varying sizes, including very large sizes to handle turkeys. In North America, they tend to be sold in boxes containing a few separate bags. In the UK and in Europe, they tend to be sold in a roll, about 12 inches (30 cm wide) You cut off the length you want, put your ingredients in, and twist tie both ends. After cooking, no clean-up is needed as they are single-use only, so you discard the bag. They also help reduce oven clean-up needed, because they contain any splattering of juices that occurs while cooking. Oven Bags are used mostly for large joints of meat and for whole poultry. They seal in steam, causing the meat to baste itself. Many fans swear by them for keeping turkey juicy. Poultry skin won’t get as crisp as normal oven baking, though. To cook with an Oven Bag, you first add a tablespoon or two of flour into the bag, and shake it up to dust the sides. The flour causes fat and juices to blend, thereby helping protect the bag from bursting. You then put the meat in, along with any seasonings and vegetables you wish. You tie the bag up with the twist tie that will be provided, and so that excess steam can escape, make a small cut in the bag , or poke some fork holes in it. Put it all on a baking pan and put in heated oven. You’ll need a baking pan, not just a baking sheet, and the pan should be about 2 inches (5 cm) deep, to support the bag as it fills with juices — you don’t want the edges of a grease-filled bag flopping over the side, where they might possibly come in touch with a heating element, melt and cause a grease fire. If making pot roast in an Oven Bag, and consequently cooking at pot roast temperatures, the meat will brown somewhat but won’t look quite as nice as it would otherwise. So, even though the directions don’t say this, brown the beef at first as you normally would anyway on the stovetop, then pop it in the bag. You will get similar results to the pot roast recipes that had you wrap the joint up in tin foil. A package of French onion soup can help give nicer colour. To check the temperature with an instant read meat thermometer, just poke it through one of the slits or holes that you made in the bag. When the meat is done, remove the baking pan from the oven, and let it rest for 15 minutes. Then with kitchen scissors, cut the bag open and lift the meat out. Some people like to bake bread in Oven Bags. They let the bread dough do its first rise normally. Then they shape the bread, put it in the bag, seal the bag, and putting it on a baking sheet and let the shaped dough do its second rise. When risen and ready to bake, you poke or cut a few holes in the bag. Fans say the steam in the bag helps the crust, particularly for French breads. Some people say that food cooked in Oven Bags doesn’t taste as good as plain old roasting, and that the food always tastes steamed. You can also use Oven Bags in a microwave, if you are inclined to want to cook meat in a microwave. While Oven Bags and Slow Cooker Liners are made of the same material, Oven Bags have their opening at the end; Slow Cooker Liners have their opening at the wider side. Reynold’s liners are 13” x 21”. The liners do not include twist ties as none are needed. Their concern is that the plastic would be exposed to extremes of temperature for which it is not certified as safe. If you lose the twist ties supplied, you can’t use just any twist tie: they may melt or catch fire. Instead, cut a thin strip off the mouth of the bag, and use that to tie it with. Don’t use Oven Bags in any kind of small oven where there’s a danger of the bag touching any of the heating elements, thereby melting, spilling out its contents and causing a grease fire. So that means no to most countertop ovens, electric roaster ovens, and to toaster ovens. Reynolds Oven Bag Faqs. Retrieved February 2011 from http://www.reynoldsovenbags.com/faq.aspx.